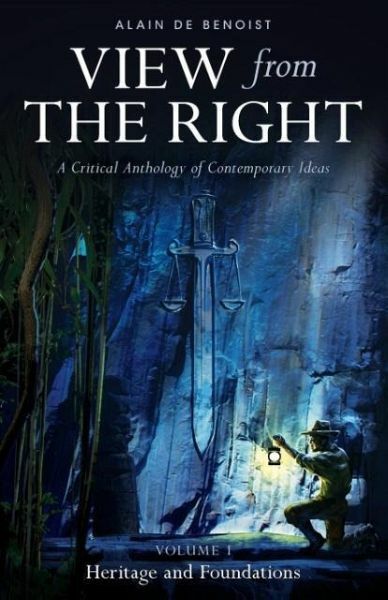 A Critical Anthology of Contemporary Ideas View from the Right was originally published in French in 1977, at the time that Alain de Benoist's GRECE think tank was at the height of its influence. The book consists of a series of essays and profiles of various thinkers and figures who Benoist considers to embody the defining elements of the various strands of Right-wing thought. It immediately took the French political and intellectual worlds by storm, and in 1978 it was awarded the Grand Prize by the prestigious and historic French Academy. It continues to be regarded as one of the most important modern French works on political philosophy, and as being the fundamental statement of the principles of the New Right during its early years. This first volume in a three-volume translation by Arktos is an encyclopedic history of ideas that addresses the philosophical, spiritual, scientific, and cultural-historical foundations of the European heritage. Alain de Benoist is the leading thinker of the European 'New Right' movement, a school of political philosophy founded in France in 1968 with the establishment of GRECE (Research and Study Group for European Civilisation), a metapolitical school of thought. To this day he remains its primary representative, even while rejecting the label 'New Right' for himself, perceiving himself as falling outside the usual Left/Right dichotomy. An ethnopluralist defender of cultural uniqueness and integrity, he has argued for the right of Europeans to retain their identity in the face of multiculturalism, and he has opposed immigration, while still preferring the preservation of native cultures over the forced assimilation of immigrant groups. Unfounded accusations of radicalism have haunted Benoist throughout his career, but have done nothing to reduce his productivity and drive. He has authored dozens of books and essays on topics such as immigration, religion, philosophy and political theory. In 1978, he received the Grand Prix de l'Essai from the Académie Française for his book Vu de droite (View from the Right). He is also the editor-in-chief of the journals Nouvelle Ecole and Krisis, and his works have been published in a variety of journals such as Mankind Quarterly, Telos, The Scorpion, The Occidental Quarterly, and Tyr. Over the past forty years he has had a tremendous impact on the philosophical and ideological understanding of the European political situation. Arktos has previously published his books The Problem of Democracy (2011), Beyond Human Rights (2011), Manifesto for a European Renaissance (2012), Carl Schmitt Today (2013), and On the Brink of the Abyss (2015). He continues to write and give lectures and interviews. He lives in Paris.